Very little is known about Neanderthal cultures (250 000-40 000 years BP), especially early ones (250 000-130 000 BP). Other than lithic implements, lithic toolkits and exceptional bone tools, very few of their artefacts have been preserved. While those that do remain include red (ochre) and black (manganese) pigments and burial sites (~50 for Europe, Near and Middle East), these indications of modernity are extremely sparse and few have been precisely dated, thus greatly limiting our knowledge of these human ancestors. 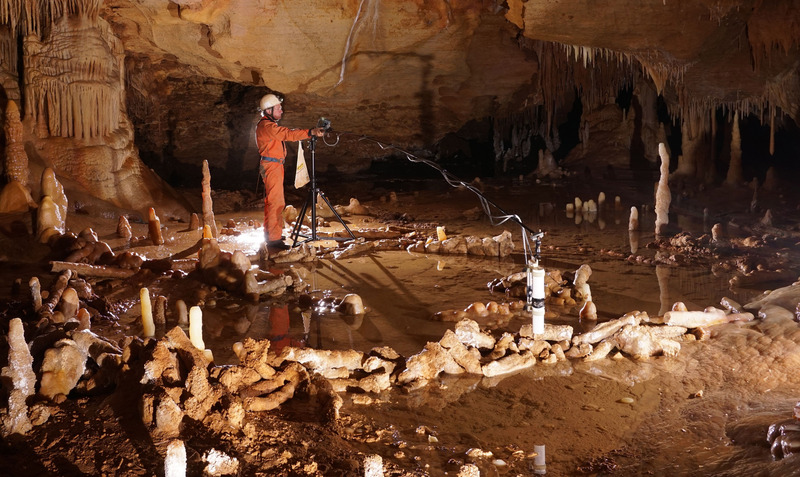 Here we present the dating of annular constructions made of entire and mainly broken stalagmites found deep in Bruniquel Cave (SW-France) at 330 meters from the actual entrance. The regular geometry of the stalagmite circles, the arrangement of broken stalagmites and several traces of fire demonstrate the anthropogenic origin of these constructions. Uranium-series dating (U-Th) of stalagmite regrowths on the structures and on burnt bone, combined with the dating of stalagmite tips in the structures, give a solid and replicated age of 176 500 ± 2 100 years before present (BP), making these edifices among the oldest known well-dated constructions made by humans. Their presence at 336 meters from the actual entrance of the cave indicates that humans from this period already mastered the underground environment, which can be considered as a major step in human modernity. These constructions found deep in Bruniquel Cave have been recently published in Nature (Jaubert et al., 2016) with Dr. Sophie Verheyden (Royal Belgian Institute for Natural Sciences, Brussels, Belgium), Pr. Dominique Genty (LSCE, UMR 8212 CNRS-CEA-UVSQ, Gif-sur-Yvette, France) and Michel Soulier (Speleological & Archaeological Society of Caussade, France). – Statistics: Frédéric Santos (PACEA, UMR 5199 CNRS-UB-MC, University of Bordeaux, France). Bruniquel is located in Southwestern France (44°05 N, 1°66 E), southeast of Aquitaine Basin (Quercy), and 80 km north of Toulouse in the Aveyron valley, an area already rich in Palaeolithic sites mainly attributed to the Upper Palaeolithic. The actual entrance is narrow and quite difficult, with two very narrow passages. We must crawl for over 30 meters. Spelunkers dug through the collapsed porch, a path through which non-claustrophobic persons can reach the gallery. The cave consists of 500 meter long gallery. After the entrance corridor, we arrive at the top of a scree (a slope with loose stones) with a large fan of debris and collapsed stone slabs. The structures are located at 336 meters from the actual entrance and daylight. We are studying the question of the filling of this entrance, and especially its dating. Early results from speleothems (U-Th) indicate a rather old age, at least at the end of the Middle Pleistocene (0,3-0,13 Ma). According to S. Verheyden, it is likely that this scree (eboulis) may be older than the structures (cf. infra). But the question is whether humans entered into the cave through this porch. On this scree the remains of large Pleistocene fauna (brown bear, wolf, red deer, reindeer, ibex and others) were found and studied in situ without taking samples. This fauna is not yet dated but is probably from the Middle Pleistocene. Without any excavation, we will measure the remains of the wolves in order to specify their biochronology (Dr M. Boudadi-Maligne, PACEA, UMR 5199 CNRS-UB-MC, University of Bordeaux, France). Bears also left numerous traces of their presence: hibernation hollows, claw marks and footprints are found at the beginning of the gallery, at the foot of the scree. The first speleologists advanced only on a materialized pathway to avoid damaging the floors with modern round-trips. The concretions are splendid, with stalagmites, stalactites, draperies, lakes with floating calcite, etc. It is important to note this because Neanderthals had essentially seen the same environment. The strange arrangement of two annular structures made of stalagmites was at first identified by the discoverers. A first study provided a map published in 1995 in Spelunca, a French journal of speleology. Rouzaud and collaborators distinguished the construction elements (broken stalagmites and whole ones), traces of extraction and the calcite regrowths. They also discovered in the structure a burnt bone in a fireplace. A single C14 AMS dating by Dr. Hélène Valladas yielded a first age of more than 47 000 BP, the limit of the method (Rouzaud et al., 1995). After the first publication, with rare exceptions (Balter 1996, Rouzaud 1996, 1997), there was no mention of Bruniquel. Only M. Lorblanchet (1999), then J. Clottes (2005, 2006) and finally B. Hayden (2011, 2012) mentioned Bruniquel and evoked the possibility of attribution to Middle Palaeolithic or Neanderthal for the structures. The premature death of François Rouzaud, along with restricted access to the cave, prevented any further research until 2014. With Dr. Sophie Verheyden, Pr. Dominique Genty and Michel Soulier, we decided to study these enigmatic constructions and we got the amazing results published in Nature (Jaubert et al., 2016). We had two main goals. First, to conduct a more accurate survey with modern methods and to more accurately describe structures by identifying each element in a database form. Second, to date these structures according to a simple concept: the top of stalagmites that are part of the structure give maximum ages while the bases of the stalagmite sealing the structures (regrowths) give minimum ages. The age of the structures must be interposed between the two. At 336 meters from the entrance, the structures were built in one of the largest chambers of the cave near its center. The structures are only composed of calcite. We have identified two categories of structures: two annular ones (A, B), and four smaller accumulations consisting of stacks of stalagmites (C, D, E, F). The largest one measures 7 x 5 meters, and the smaller 1-2 meters in diameter. A total of 420 pieces were used, here designated as ‘speleofacts’, comprising a weight estimated of more than 2 tons of stalagmites. Access to the remains is not easy and requires significant taphonomic analysis. Indeed, parts of the constructions are partly under water, while others are covered with clay. But from a taphonomic point of view, the main problem is the presence of calcite. Most of the structures are covered by calcite – a fine layer, a thicker crust and regrowths posterior to the construction. As such, from the 3D model (photogrammetry P. Mora), we have asked our colleagues (F. Lacrampe-Cuyaubère, X. Muth) to remove as much recent calcite as possible, especially regrowths, to obtain a new reconstitution without the recent calcite. It was important to prove the anthropic character of the structures. We calculated (with F. Santos) the comparisons of the dimensions of bear nests (hollows) and the two annular structures of Bruniquel. The orientation and azimuth data in the main structures are similar and do not show any preferential direction according to the Schmidt diagrams. This confirms that such orientation and slope patterns cannot be due to natural processes related to water flow, mass flows or other gravitational processes. Concerning the building material used, our first observation was that the ‘speleofacts’ almost exclusively selected had been stalagmites but no stalactites. There are also some elements of flowstones. But the nature of the preferred elements is clear: they are almost exclusively stalagmites, and mainly single. Our study also shows that these stalagmites are rarely whole; they are fragments and were clearly broken and sectioned. Half of the elements consist of the middle part of stalagmites (mesial), then distal and proximal. The stalagmites are well-calibrated with a mean length for the large ones and another for the smaller ones. All statistical measurements and tests (F. Santos) strongly confirm an intentional construction. The main structure can be distinguished from the others by very large speleofacts. The main annular structure is composed of one to two, three or even four superimposed layers of aligned stalagmites. 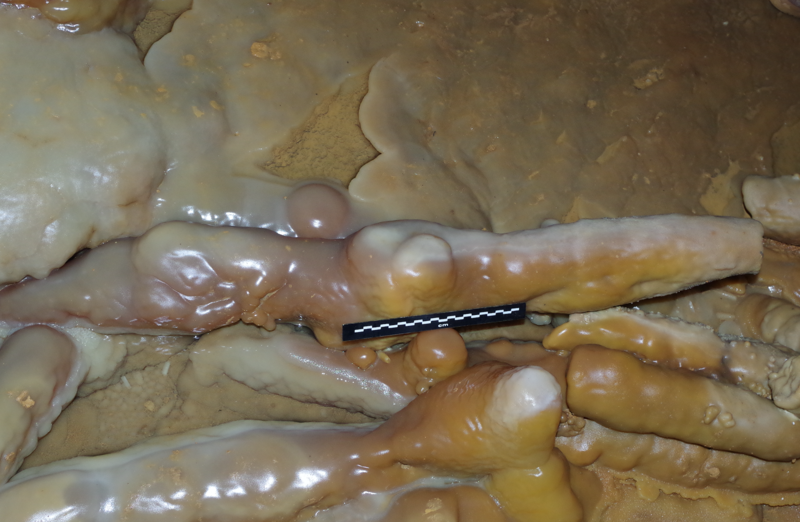 Interestingly, some short elements were placed inside the layers of stalagmites to support them as wedging elements. Other stalagmites were placed vertically against the main structure in the manner of stays. The first study published (Rouzaud et al., 1995) identified only three fireplaces. We discovered 18 of them. Traces of fire and areas with burnt remains are present in, and on, all six structures. Only one is on the ground. But this is normal: a thick calcite crust prevents access to the original soil, except in this zone without calcite. We have observed burned bones, soot and burned speleofacts, reddened and blackened and more or less fissured. A dozen black bone fragments are observed in the structures. Most of these fireplaces were clearly heated, as confirmed by magnetic measurements for the most striking and evident reddened and blackened zones. The map of magnetism (F. Lévêque) reveals even three other zones of fire under calcite. The largest burnt bone sampled by Pr. D. Genty for dating was covered by a thick calcite. Another black fragment was trapped in a core between a speleofact and the calcite regrowth. These remains were clearly heated by humans, as indicated by molecular and atomic spectrometry (infrared, Raman: Pr J.-N. Rouaud, D. Deldicque). The age of the constructions has been determined by uranium-series dating (U-Th) of the stalagmite calcite (Pr Hai Cheng and Pr R. L. Edwards). The top of stalagmites that are part of the structure give maximum ages, while the bases of the stalagmite regrowths sealing the structures give minimum ages. Eighteen samples were taken for dating by ICiPi-MS uranium-series (S. Verheyden, É. Régnier, D. Genty, S. Delaby). Four additional samples were also dated: one from a core taken in the flowstone and three from the calcite-crust covering a burnt bone. Ages obtained for stalagmites used in the construction provide a first indication. They are distributed between 177 000 years BP and more than 400 000 years BP. More interesting is of course the age of the calcite regrowths covering the structure. The two oldest ages are situated in the same timeframe. They partially cover the age of the youngest dated-stalagmite in the structure. All other ages according to this chronology show that the stalagmite-tips are contemporary to or older than the calcite regrowths. Moreover, additional evidence for human presence is provided by the burnt bone, which is older than 180 000 ± 20 000 years BP. The age of the flowstone situated inside the structure is similar, suggesting that the climate during this period, covering isotope stage 6 (MIS 6), was sufficiently humid and warm enough to allow continuous calcite deposition despite generally glacial conditions. These results indicate that the structure was built around 176 000 years BP. The construction of such structures involves the choice of the raw material (stalagmite), its extraction, fragmentation according to standard dimensions, followed by its transport and placement according to a plan. It supposes a minimum degree of skill with architectural techniques such as inserting wedging elements between two rows of construction. The number of ‘speleofacts’ used (420), as well as their weight (2,1-2,4 tons) requires simple but long procedures. This work would also have required adequate lighting. Combined with the long entrance to the chamber, this information indicates that it was a collective project and thus a form of social organization requiring design and discussion by several individuals, as well as a distribution of tasks. The attribution of the Bruniquel constructions to Early Neanderthals is unprecedented in three ways. First, it reveals the appropriation of a deep karst space by a pre-modern human species: Neanderthals and even Early Neanderthals. Until now no site of this age in a deep cave environment, a difficult environment, has been recognized. The few Middle Palaeolithic examples could not be verified or concern only entrance zones lit by daylight. The oldest evidence is known in Europe (e.g. El Castillo in Spain, Chauvet Cave in France: 42-32 000 cal. BP) and South-East Asia / Sunda, Wallacea (Lean Leang, Pettakere Cave, Sulawesi, Indonesia: 40-35 000 cal. BP). These sites are thus younger than 40 000 cal. BP and are always associated with Homo sapiens. Symbolic rock art was the main reason for these cave visits. It is another world. Second, it concerns elaborate constructions that have rarely been reported before. Except for the discussed case of the Lazaret cave (Nice, France, 130-160 000 years BP), most of the examples come from European open-air sites which are habitat structures (e.g. Maastricht-Belvédère (Netherlands), Molodova I (Ukraine), Ripiceni-Izvor (Romania), La Folie (Poitiers, France)) mainly dated to the Late Middle Palaeolithic. Here we do not discuss the function of the structures of Bruniquel, a topic on which we are just beginning to work, notably with Pr. Brian Hayden. Third, we have evidence of fire maintenance. 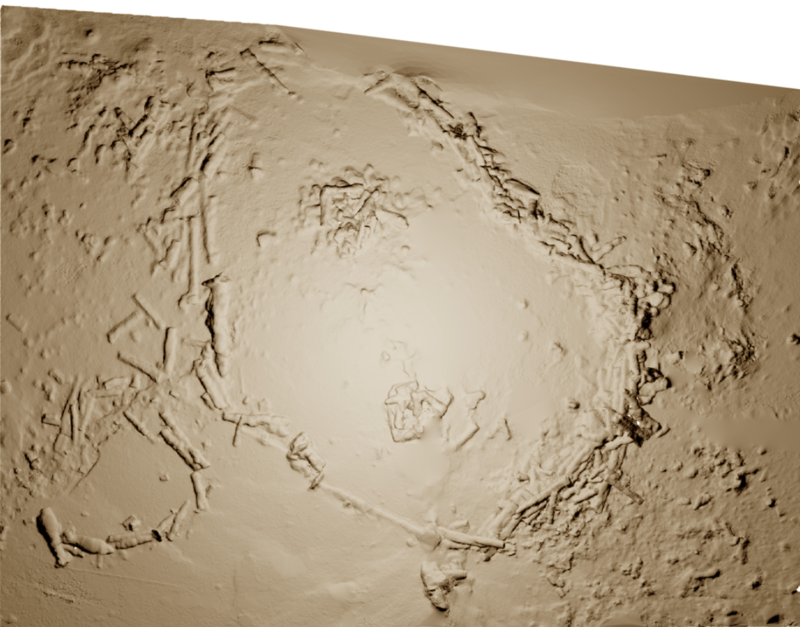 Traces of fire are rare for the early Middle Palaeolithic. So, in Bruniquel, mobile lamps or torchlights were also forcibly used. And it is doubly interesting because, here too, the oldest archaeological lamps known are found in the Upper Palaeolithic. Our findings suggest that the Neanderthal society of Bruniquel included elements of modernity which can now be proven to have emerged earlier than previously thought. The use of stalagmites is also unique for periods older than the Upper Palaeolithic. The presence of this kind of structure far from the entrance indicates that Neanderthals had already mastered this strange and dangerous environment, and this can be considered as an interesting step in human history.